Gigantic fungi have sprouted in London’s Kew Gardens, thanks to sculptor Tom Hare, who created an installation called Fungi Fairy Ring for the IncrEdibles exhibit, a celebration of “autumn’s edible delights” that runs through November 3rd. 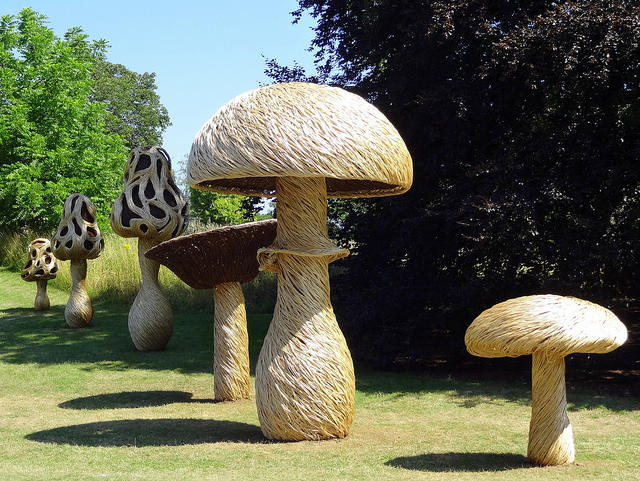 Working with mycologists from Kew’s Fungarium, Hare created a series of sculptures made from woven willow, representing seven different species of native edible fungi. The sculptures, which tower up to 12 feet, are based on close collaboration with scientists to ensure that they not only portray each type of fungus accurately, but also show various stages of their life cycles. Not to mention that their giant size makes them ideal to use as backdrops for photos of full-sized humans as gnomes and fairies. This entry was posted in The Art of Science and tagged Fungi Fairy Ring, Kew Gardens, mushroom art, mycology art, science art, Tom Hare. Bookmark the permalink. Reblogged this on Ranny D.M..